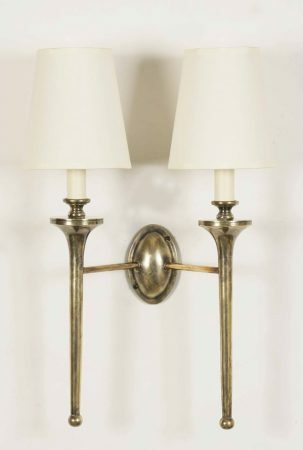 This Grosvenor solid brass Edwardian style twin wall light is beautiful and handmade in Britain. Featuring a detailed cameo wall mount, two elegant tapered torchère light arms, with candle tubes and gold lined tapered ivory shade. Shown here in a distressed light antique finish but also available in polished and aged brass and with black or gold shades if desired. From our handmade replica Edwardian wall light selection. Timeless replica lighting made to last a lifetime. Handmade in the UK and finished to order.